Book a free 20 minute one-on-one computer assistance session with Woollahra Libraries volunteers. You may bring in your own devices or use the library computers depending on what you would like to learn. To guide us and to help you get the most out of these sessions, please come prepared with either specific questions you would like to ask, or an idea of what you would like to learn about (e.g. email, ebay, downloading an eBook). Visit the links above to find a session and book in. A series of monthly workshops, with a different topic each month, designed to meet the technology learning needs of the local community. 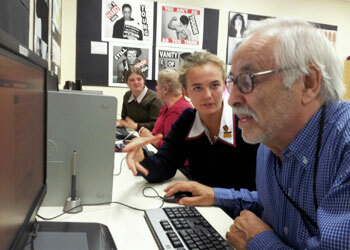 Tech at Ascham (previously know as 'Easy PC') is a free, weekly digital technology training program which runs for 5-7 weeks, offering personalised learning for people aged 55+. The next course runs for 5 weeks In Term 2. Booking available now. We ask participants to commit to all sessions to take full advantage of the program and to minimise disruption to students. Parking is available at Edgecliff Centre, 287-295 New South Head Rd. There is no parking onsite. Tuition is provided on a one-on-one basis by high school students under teacher supervision. The program offers participants an introduction to computer skills or digital skills development. Schools offer use of computers, or you can bring your own device (such as; laptops, tablets, phones). Please note you must be a resident of the Woollahra Local Government Area to participate in the Tech at Ascham program and preference is given to first-time attendees. The girls were very helpful with all my devices. Thanks so much for the thoughtful event that council has arranged for senior citizens. Anyone over the age of 15 is invited to become a Bushcare volunteer. Our Bushcare volunteers include local residents, retirees, businesses, community groups, school groups and tertiary students. It’s time to become a Tech Savvy Senior! Join us to learn the basics. A free 5 week course for people aged 55+ years with one-on-one tuition offered by high school students to help build up your skills and confidence in a relaxed, informal and supportive environment.